Derište aka JaneDoe, i personally invested $5000 in this, how much have you ? Just try to put yourself in my position. I feel like idiot spending time on this project, instead of spending more time with my daughter. Stephanie, why do you think i have something against Sanja? And why i would not give her export? She just need, like everybody else, to ask for export by email, and she will receive it. Also, i see Sanja is in constant contact with you, why you need to speak in her name and defend her ? Sorry, i don’t do exports, she will need to send an email. I am lucky to know people like Stephanie, and Pedja aka Blogowski, and honored that Tatjana aka Mooshema is reading my posts. These people have bloged about my temporary disappearance from blogosphere, and things that happened , not just to me, but also to 8 other blogers. They have mentioned me and my blog in their posts, and unfortunately, it seams that this story has gone into a wrong direction. The problem is not my conflict with blog381 administrators and owners. 8 other blogers have the same “destiny” like me. And about 7 more have decided to leave that system. The main issue here is ultimatum which we’ve received. you have my e-mail address. If you are wiling to send me my own posts, you can do that. Insisting that I send a request is a power game. If you are interested to hear other side of the story, you can contact me via email. Also, please ask your friend Sanja to read and translate the text on the blog381.com front page. There was a much easier way to export posts and comments from hers blog. As far as I know this is not a result of a quarrel between Tanja and another popular blogger, and I happen to know the stories from both sides. So this is not as personal as it has been presented. And as far as I know the export function is not disabled, and bloggers can still retrieve their blogs, if they want to. I’m not on this or that side, and I’m not in the middle of all of this. I just think that the only fair thing to do is to present things truthfully and objectively. “admin”, you're welcome to post the other side of the story here if you wish, though I have to say I'm not that interested in the internal details. One thing surprises me, though: if you were willing to let people export their blogs, why remove the export function from WordPress? Doesn't seem to make much sense. Ah, and telling us right away what that line says would be simpler than asking me to ask Sanja to do it… no? Also, please be kind enough to comment with your name. I don't like it when people hide behind roles. Thanks. Katherine: thanks for your comment. Look at the first screenshot I posted. The export function has been disabled. Normally there is an extra tab after “Import” which gives you options to export the blog. You're welcome to give a little insight what brought about the situation, particularly if you've heard both sides of the story. Would you please be so kind and do not link my blog in your post, because my private blog is not related to the 381 system. Therefore, I don’t see the relevance of linking my private blog and present it in such a way. It appears that all the fuss is about a simple misunderstanding. If we look at the home page at http://www.blog381.com, it is obvious what the procedure is. Export function must be turned on manually for every blog. Unfortunately, it is the characteristic of the system, as I understand (please forgive my ignorance here, I have to go by administrator’s advice that it is). As there are numerous blogs on the system, it is only reasonable, and I would personally do the same, to service keenest bloggers first. The most efficient way to do so is by requesting export function be enabled by email. I have done so, and got it without any delay. I personally do not see it as a power play in any way, although in these unfortunate cirucmstances it may appear to be so, especially if there is a bit of emotion involved. I plead to all involved to remain calm-headed, as I understand that everyone will get their blogs and no one will suffer any loss. I have faith in owners and administrators of http://www.blog381.com system that they will stand behind their word and allow the retreival of all data owned by bloggers. Lang/Tatjana: I'm using your personal blog to link to you as a person, who happens to be behind 381. That seems perfectly relevant to me. As a matter of fact, export was and still is available. Oh, and Tatjana/Lang: redirecting my visitors to CNN is not a good idea. I've added a note to my post explaining to my visitors that they'll have to copy-paste your link. First of all, greetings to you, Steph. As a matter a fact, I think it's really nice that you took interest in this particular case. I used to have blog on 381 for quite some time (almost 9 months), but since I've refused to delete some “infamous” comments (like the one in which “popular blogger” you've mentioned wishes me happy new year), my blog was removed. So, there are few things I'd like to point out… 1. there used to be an export function – it's quite obvious that it was intentionally removed; and 2. even though 381 is now closed, some of the 381 blogs are still on-line. I'd really like to know what was the criteria? Obviously, some of the bloggers still have to ask admin for export, while the others still have full access to their blogs. Talking about fairness and equality. I am really trying not to be sarcastic here, but how far you can understand if you do not understand Serbian? We worked for free on this project, and we have invested our time and our money (just think of servers costs). Simple, our goal was to bring blogging closer to Serbian internet users. Unfortunately, our system was under all kind of abuses, and we just couldn't continue anymore. Stephanie, you did not ever support us, and i really do not understand why you need to show us as bag guys. Right, 10pm, time for bloggers and trolls alike (emotional appeal and other red herrings seem at work here) to go to bed. I'm turning on comment moderation during the night, given the tone of some of the comments left on this post this evening. I'll publish your comments in the morning. I just wanted to explain why my blog on blog381 iz on. When I saw the whole system was down, the first thing that got on my mind was to email the administrator to ask what was going on. As a result, my blog was enabled, with an export option of course, and it will be on untill I set the things up for a new domain and host. I don't need to be told what to do to retrieve my data, I just asked. As simple as that. Thanks for the information, Ivana! However, if I understood correctly, I think Sanja/Aurora's blog was deactivated before the whole system was shut down. Correct me if I'm wrong here. I think it's sinking in: you e-mail the administrator, and they re-activate your blog with an export function so that you can remove your data. Did I understand that right? Have I understood things correctly? I realy don't remember. When I tried to log to my blog, everything was already disabled. No problem if you don't remember. But what I understood about the “export” process is correct, I think. Apologies for comment in Serbian included below. I will attempt to translate it in not too distant future. The essence of my thesis is that the bloggers, who are sole benefactors of a blog system such as blog381 (which do not charge fee or have advertising or any other income from blog activity), have moral and ethical responsibility to be loyal to the system that provides them with life support for their blogs. Otherwise, the owners of the system have the moral, ethical and “hygienic” right to exclude disloyal users in order to protect the vitality of the system. Nothing strange, nothing unusual, nothing to be concerned about. No one wants children to let thiefs in while parents are not at home… Or perhaps children have ethical right to exercise “democracy”? the blog381 system is closed: how do users retrieve their data? before closing down, blog381 shut down a certain number of blogs for “violation of terms of service”: what were the circumstances? So, for the first problem, you’re very right. It’s quite clear that there is a message stating one simply has to contact the administrator to have the possibility to export. Well, unless I’m missing something painfully obvious, this means the export function was disabled at some point by the blog381 admins. And I have two people here, one being Sanja, the other being Derište (whom I do not know), who are telling me that there used to be an export function on blog381. So, maybe somebody from blog381 will, finally, explain why this export function was deactivated. As for reactivating it, well, let me put it this way: I’d know where to start to reactivate the function for all blogs in the system, with a script (shell/PHP) or an SQL query (depending on how it was deactivated). So I’d be very astonished if the person administrating the blog381 system was not capable of doing that. The request that people send an e-mail is an administrative requirement, not a technical one. From a technical point of view, it would be quite possible for the administrator to generate an export of each blog on the system and e-mail it to the owner of the blog. So, some explanation on that would be interesting — but actually, this is not what my blog post is about. My blog post is not about the shutting down of the blog381. I don’t care about that one bit, actually. What I know is that Wednesday at 11pm, Sanja told me she was under ultimatum to “clean up her blog, or…”. You’ll note that I’m not saying “or her blog will be deleted”, because based on the warning in the forums that I have here in this blog post, it is not that clear. But what is clear is that she would not be allowed to remain on the blog381 system, as she had no intention of removing the links and comments in question. Obviously, what was going to happen to her data was quite uncertain, and given the circumstances, she had every reason to worry that it might be destroyed, and trying to figure out how to retrieve the data from her side was a rather sensible thing to do. Yes, she probably could have e-mailed the administrator. But look at it from her perspective: there used to be an export function which had been disabled. What does that seem to point to? Well, for me, it’s a rather clear indication that the owners of the platform/system do not want users to be able to retrieve their data (if there is another explanation, well, it would honestly make the owners of the platform way better in this story if they shared it with us). It’s very delicate for a blogger to be in the situation where one has put one’s data between the hands of people one is now in conflict with. In a general way in the web world, be it for blogging platforms, social networks, or any other kind of tool where people create content and put it in the hands of a third party, it is a widely accepted consensus that the users should have the possibility to retrieve their data themselves, should they wish to. Blog381 denied that to their users, and this is the reason I wrote this blog post and diapprove of what the blog381 owners did. It is the combination of giving certain users an ultimatum to leave and denying them the right to export their data themselves. You will not that I am not talking about the shutting down of blog381, here. I will answer your other comment in a separate comment. On retrieval of data, it appears that both you and I agree that all users shall be able to get their precious data. End of story. I am a blog-lay man, and the fact that I had to ask for an export function to be enabled seemed like nothing exceptional. I obliged, and got my data within minutes. People with more expertise, such as yourself, may have seen this as a burden. I personally have not. I disagree that there is a “contract” between a blogger and the owners. Let’s remind ourselves what a contract comprises – an offer, an acceptance and CONSIDERATION. Certainly there is a service provided by the blog owners, but there is no consideration as such, as the membership is free (there is not even a peppercorn paid by the blogger for the service). Hence, although there are certainly conditions of use, we cannot speak of a “contract” in the business sense. As this relationship effectively goes beyond business (in my opinion it is actually completely outside it), we must start including other factors such as morality, ethics, loyalty, good manners, etc. And that is what I am talking about here, what we disagree about. Yes, relationship indeed goes both ways – the blog owner agrees to protect and publish data, and the blogger agrees to be loyal to the host system. Simple, clean, moral, ethical… ideal. Ozon: a contract does not require money to exchange hands. Subject is closed. Do you really believe what you say? That bloggers have to be loyal to their blog host? Honestly, this is a pile of horseshit. Bloggers trust their host with what they have most precious, their data. The bloggers do have a duty to respect the terms of service of the blogging platform they are using, because the relationship between the blogger is based on a contract. But a contract goes both ways. The blog host also has a responsibility towards the bloggers they host. Keeping the system online, for example. Not exerting censorship. Allowing sufficient freedom of expression, as determined by the terms of service. There is nothing moral or ethical in there. It's a business relationship based on a contract where both parties have rights and duties. So, Ozon, your parallel with children and parents is really out of place and brings nothing to the understanding of this situation. I'm not even going to respond to your “question” about children, thieves, parents and democracy — because it's totally irrelevant. The only thing that could be interesting here is if blog381 had terms of service, and what they were. And also, what the conditions where for a change in terms of service — which is clearly what happened here with the request that bloggers on the platform refrain from displaying certain links and comments on their blog. But even if what happened here is within the terms of service of blog381, it's still my right to state that I think such conditions/behavior is unpleasant. I was user of 381 blog system. There was export option, I have a proof for that, ‘couse I exported my posts and comments a while before “case” in matter, and import those files to WP. If that option did not existed, how that was possible just a few days before? We’re not familly or friends with the owners, we were just users, and it’s sneaky to impute something like “loyality” or good maners…it’s a two-way street. I don’t want to dispute any longer, have a nice day. And yes, it was a blackmail. FYI, we were not using WordPress MU. Export feature was disabled. Several blogs were hacked (due to weak passwords) and posts were exported. Glad to know there's a “reasonable” explanation for deactivation of the export function — though I'm not sure it's the course of action I would have taken. You have to admit that the timing is pretty bad. If people are under ultimatum to clean up their blogs and they notice that the export function, which was there previously, is not there anymore — well, it kind of looks scary from their perspective, doesn't it? Besides, technical support in local language, unlimited disk space and bandwidth usage per blog, we had one nice feature that is not available on wp.com (nor wordpress mu). Bloggers were able to fully customize WP themes. They could fully modify CSS and all themes PHP files absolutely free. This feature provided great flexibility, so blogger could install all kind of gadgets, widgets, etc. AFTER the whole system was disabled. When Mihailo, the 381 administrator, wrote here in the comment that I should sent him the e-mail with a request of retrieving my own data, I did it. I've sent the e-mail. So, if anyone didn't menage to ask for it's own data in past two days. . .well, it is too late now. Good evening Stephanie, I thought you said decisively that the discussion about loyalty is finished. Why selective moderation of my comments, and none of whisperer’s? If you have closed the discussion on this off-topic (for which I fully took responsibility), please close it for everyone and moderate accordingly. I am sure you strive to remain objective, and wouldn’t you agree that fair moderation suggested herein would be a reasonable way to achieve this? BTW I do regular backups #:))) so restore shouldn’t be a problem …. It’s my pleasure to host LudiZmaj…. Ozon: you’re right. However, note that I let slip your first post “continuing” the subject I didn’t want to discuss. We we’ll leave whisperer’s too, but you’re right. I won’t accept anything more around that. Is there anything we can do at WP.com to help out? Hey Matt, thanks for stopping by. Thankfully, the situation seems less dramatic than I thought at first, as it seems the blog381 hosts are letting bloggers export their posts if they wish (if that’s still the case — haven’t heard from my friend Sanja, so I don’t know if she got hers). Quite a few of these bloggers have moved over the wordpress.com, from what I’ve seen. I’ve thought about this a bit more, and I’d be happy to purchase or assume the costs of blog381.com from its owners if they’d be willing. We could re-enable the export globally and provide redirects to help ease the transition of the people to other hosts. If the owners are interested in this, feel free to contact me. I may have a workable WordPress WXR that you can use to import into a new WordPress installation based off of Stephanie’s posts and comments RSS that she downloaded. You can reach me at [email protected] and I can email it to you. Dossy: you need to publish how you did this. Could come in handy for others. Thanks so much. Stephanie, you think so? I’ll try to write up a blog post about it tomorrow, with the Tcl scripts I used to do it. I've thought about this a bit more, and I'd be happy to purchase or assume the costs of blog381.com from its owners if they'd be willing. We could re-enable the export globally and provide redirects to help ease the transition of the people to other hosts. If the owners are interested in this, feel free to contact me. Tu peux dans des cas pareils essayer un soft d’aspiration de sites comme HT Tracks… ça suit tous les liens et ça fait une copie de la page html sur le disque. I was sure some part of this story should be kept from the public, but after receiving a ton of bad publicity, i have to add a few more words. Anyway, I was contacted by the police. They have been asking questions about ‘pretty popular serbian bloger’, and his activity. I was told they are investigating credit card fraud. We did not want to support any criminal activity, and we asked (or blackmailed?) bloggers to remove links and comments related to ‘pretty popular serbian blogger’. Now when Mr Matt is here, I am sure he can check their records why zmajcek.wordpress.com has been suspended on their system. OK, Mihailo. If that’s a truth, why you couldn’t write something else in the announcement to 381 bloggers (which is above in this post) ? You absolutely can question my comment, and that is fine with me. There is a reason why I asked Mr Matt to check their records (if possible), about that one specific blog that is closed on their system. There is a chance that blog is closed due to credit card fraud. I am sure, we all here, take credit card fraud seriously. We took actions the way we thought it was best for us at that moment. I am also very interested to hear other blog platform owners on this one. I had a blog on blog381.com, and I am sorry that I can not export my blog to a different location. 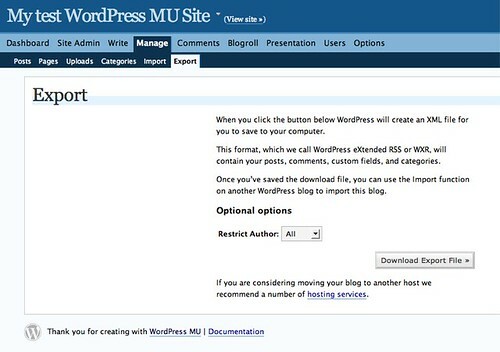 I hope we will have a chance to do that and to try to continue on WP blogging.